The operating system that allowed to use Android in old PCs, Remix OS, will also reach the smartphones. Yes, because the three former Google engineers who created this project decided to bring their idea to a new level and, in general terms, to allow all users, especially those residing in remote areas, to obtain a Custom ROM that can also be converted into a PC, with a simple connection to a monitor (without having a computer at hand). And it is that Remix OS is making important numbers with its desktop system, thanks to an easy installation on PC, but also because it is light and immediate. It has given users the ability to reactivate outdated PCs with a version of Windows that barely allowed them to use them, while using the Remix OS they can. Jide wants this to be possible also for people who do not have a real PC, but a smartphone. Here is Remix OS for Mobile. An idea that has already been seen and experienced by Microsoft with Windows 10 Continuum, but unfortunately did not get a great success due to the scarce sales of smartphones with Windows 10 Mobile. Called Remix OS for Mobile, the idea behind this new fork is simple: connect your smartphone to a monitor, and get the experience of a desktop computer in your hands. Call it Continuum, if you wish, but keep in mind that Jide chose the name Remix Singularity. In any case, the concept is the same and quite clear in itself. 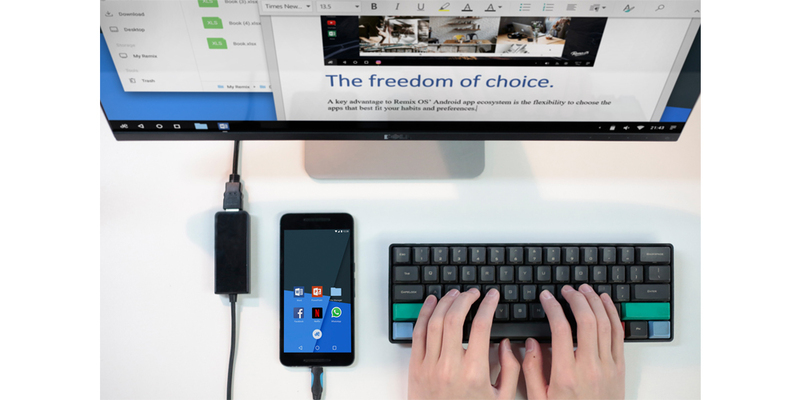 On the other hand, it is clear that while the smartphone connects to the monitor, you can still continue to use it as usual, while Remix OS runs on the larger screen. Jide tries to satisfy less demanding users, but still looking for the best Android user experience, even on the PC, without essentially having a PC. As for the system to run on smartphones, it will be as close as possible to Android stock and will be available initially for the Nexus 5X and 6P. At the moment there is still no release date, nor any precise specification, which makes us think that we will have to wait several months before we can use the application.